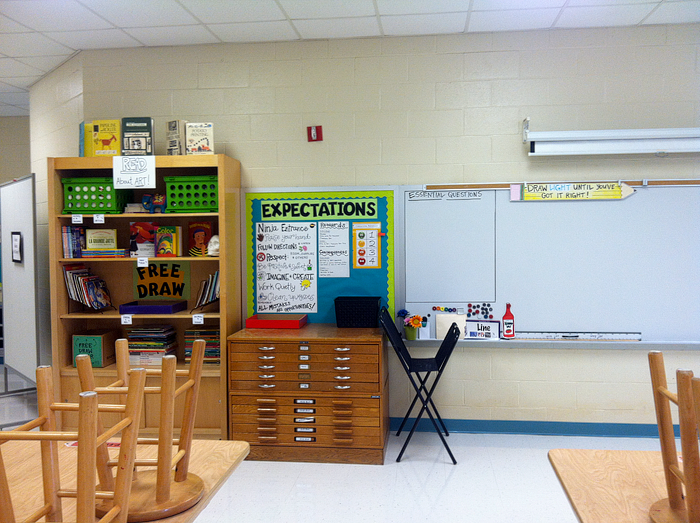 School doesn't officially start until next week, but as the art teacher I knew I'd need to take care of some things before everyone came in. This will be my third year at my current school, and every year I've created a giant bulletin board based on our yearly theme. 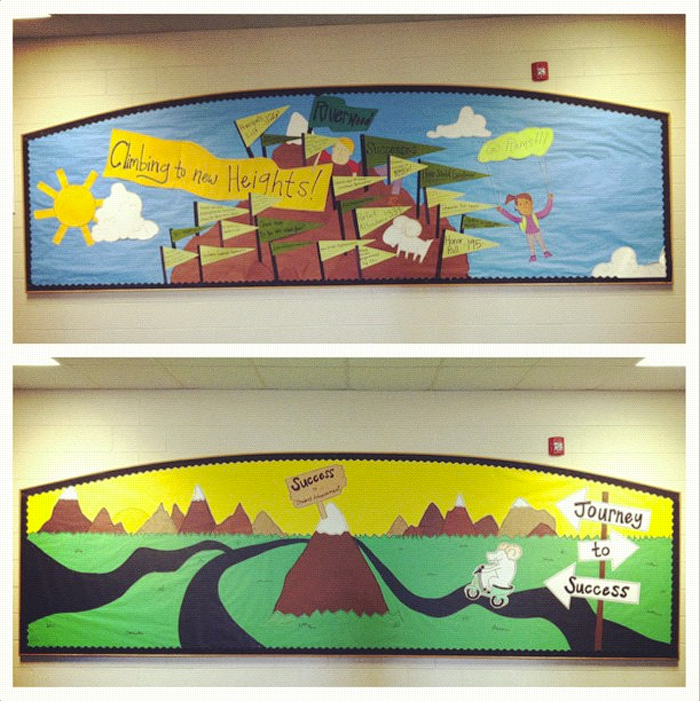 Our first theme was "Climbing to New Heights" and last year's was "Journey to Success." 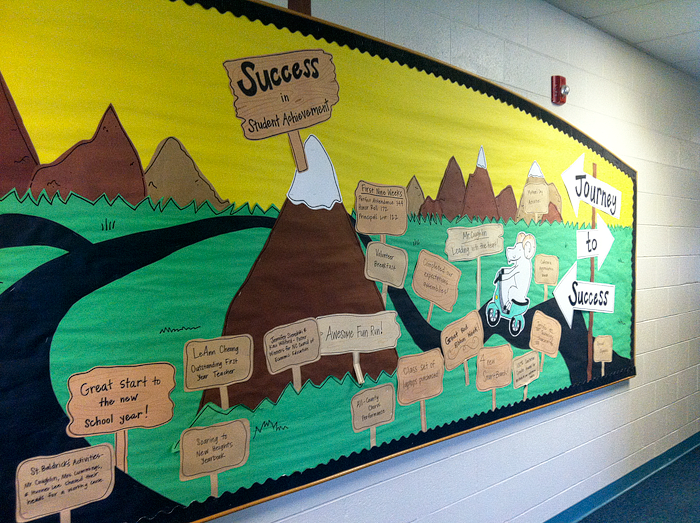 We keep track of our successes throughout the year on the board. The first year's successes were flags and last year's were signs. 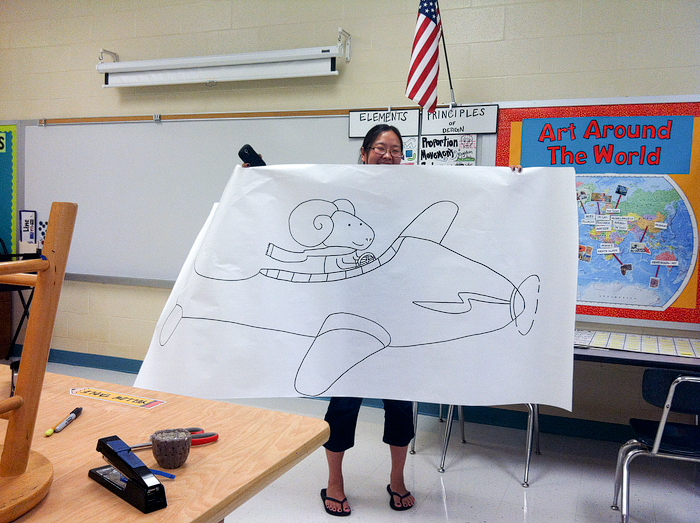 This year's successes will be messages in a bottle because our theme is "Set Sail Together on a Learning Adventure." 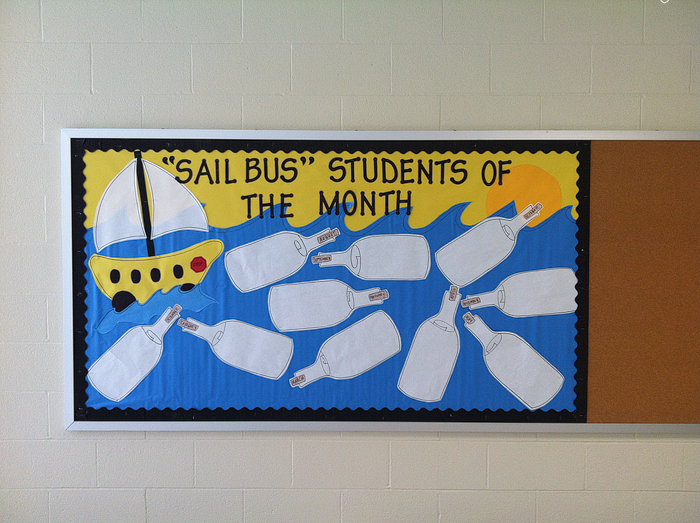 I also do the bus student of the month board, but I don't have photos of all three years...drat! 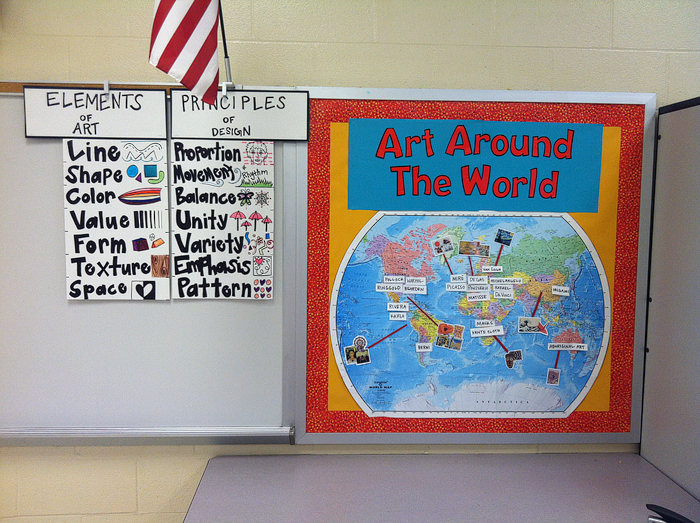 The board beside this one is usually reserved for art work, but they are still deciding if they are going to let me keep it this year or put character traits there...we'll see! 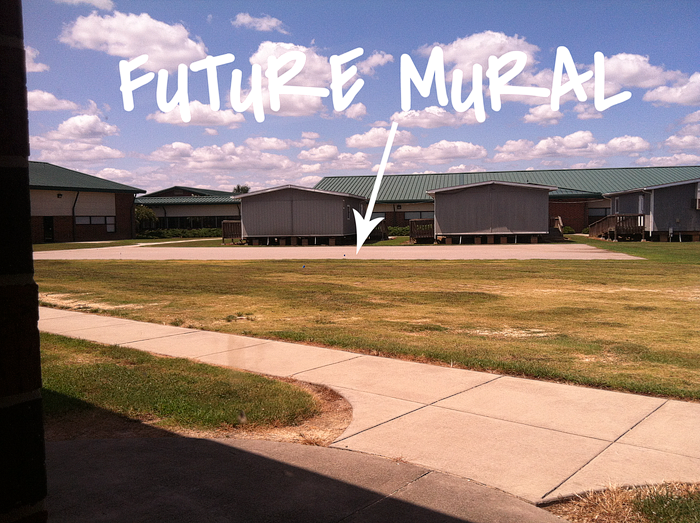 I worked in my room a lot this week while I waited for word on the mural plans. It has really taken me a long time this year! I worked Tues-Thursday in my room and I'm still not finished! Thank goodness I went in because teacher workdays start next week, and we don't get tons of time in our rooms with trainings and meetings all week. I would be spastic next week if I hadn't done a few things already. 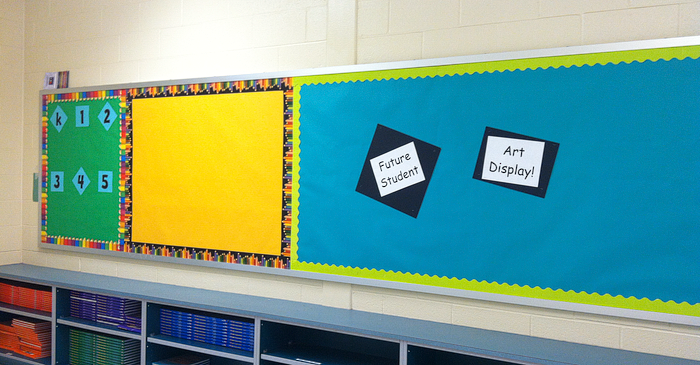 As if I hadn't made enough bulletin boards, I needed to work on my own too :). I keep up with current projects on the far left, and the other boards will be art work. "Draw Light Until You've Got it Right!" This is something a lot of my kids struggle with. 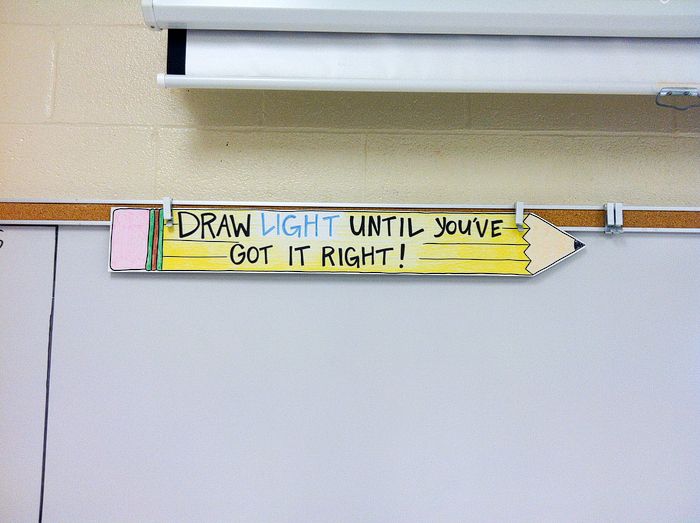 Hopefully this little reminder will help with the frustrated eraser frenzies that I see all the time. My rules poster was inspired by a few posters on Pinterest. I love that site! "My favorites are Ninja Entrance" and "All Mistakes are Opportunities." 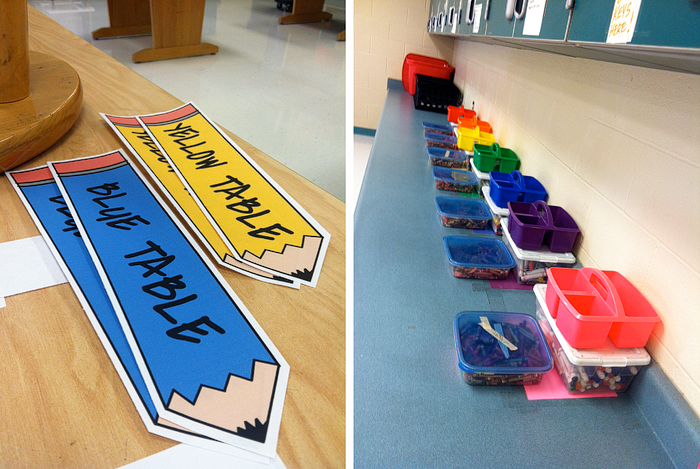 I used a new treasure box system last year where every class earned a color when they had great behavior, and once they got the whole rainbow they got to go the the treasure box. It worked really well, but this year I needed to make a new poster. I decided to make a paint brush with paint drops. Every teacher has a little sticky note that I will move down the board until they reach the puddle. Once they reach the puddle, it's treasure box time! I usually have starbursts, jolly ranchers, stickers, and tiny erasers in there, but most of the kids go for the candy. I had my world map in the back of the room last year, but I use it so much I decided to put it up front this time. I also made some new table labels. My room is super color coordinated. LOVE IT. And my in-progress word wall. I have a bunch of posters like these where I've put collage, sculpture, drawing, painting, and textiles, but they go in the places I can't reach. I'll post them later. 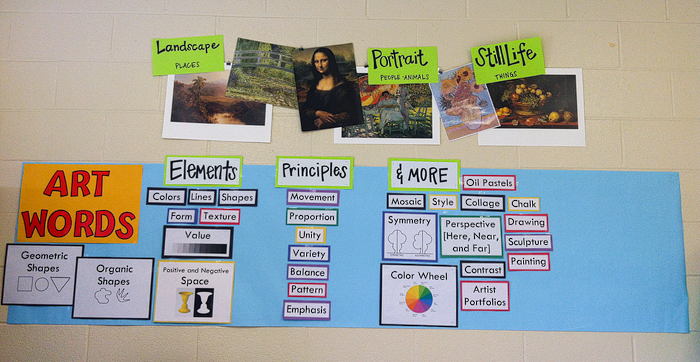 I added landscape, portrait, and still life this year. 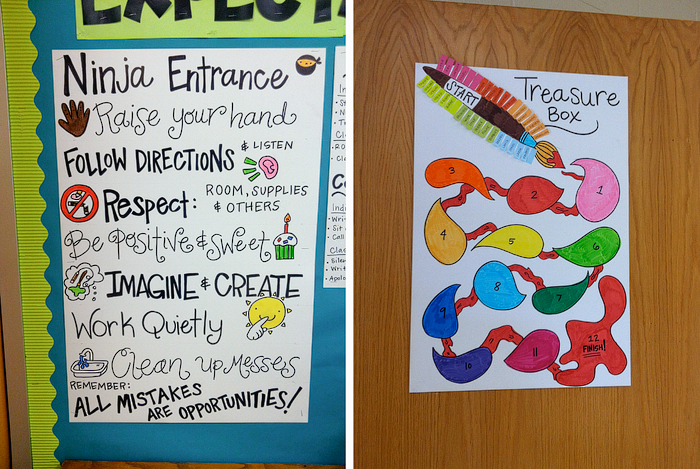 I'm hoping to incorporate more of each this year! That's all folks! I'll probably post a full room tour at some point 'cause I'm that kinda gal. 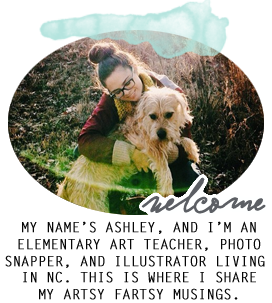 I'm going to be posting mostly school stuff on this blog from now on since I have a new photography blog, so stay tuned and enjoy your last few days of summer! I love your visuals. Did you use colored pencils on the large pencil? Looks very nice! Thanks Kristin! I used crayons actually :) much faster! Amazing. All of it. So inspirational.